Samad Quinton Pierre-Muhammad was born on December 17th, 2009, 4:20pm at Lankenau Hospital in Wynnewood, Pennsylvania. 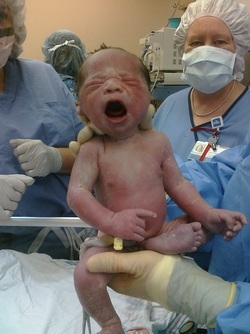 Born at 36 weeks, Samad weighed 6 pounds, 4 ounces and was 17 1/4 inches long. Although he was a little early, first time Dad (Omar), Mom (Kheli) and big brother (Masieh) were eagerly awaiting his arrival. After an emergency c-section because of a low heart rate, Samad was born as a presumably healthy baby boy. As the East Coast was preparing for the winters' first snow storm, my husband and I were welcoming our baby boy into the world. Family from all over was calling with their well wishes, blessings and most importantly prayers. It was a chill in the air so we didn't have many visitors, but there were a few who couldn't resist, Grandmom Arlene, Aunt Mika, Sis Marchelle and Sis Andrea (Bubbie). It was nearing the end of day 2, Samad and I were bonding as I was nursing him and Dad was nearby watching in amazement in what Allah (God) had blessed us with. The snowflakes began to fall around 9pm on December 18th and the next shift of hospital staff were making their rounds. I had just finish nursing Samad for the 10th time (smile) and the pediatrician came in to make her nightly rounds. After the usual questions, she picked him up and immediately noticed that he was cold. I then explained to her that I just finished nursing him and was practicing the "skin to skin" method (naked baby). She smiled, wrapped him up and simply said, "Okay, no worries, I'll pop him in the warmer for about 30 mins and bring him right back to you." I must have fallen to sleep because it seemed like hours since the doctor had taken him away. So I asked Omar to page the nurse. By now the snow was falling pretty hard and there were blizzard warnings on all of the local news stations. Just as I began to grow worried in came the nurse with a very frantic look on her face. She introduced herself as Karen a NICU nurse. A sense of panic came over my body as I realized that NICU was the Neonatal Intensive Care Unit. Nurse Karen explained to us that Samad's heart rate had drop, he stopped breathing and his body had went cold. No words or tears could nor still can express the pain that we were feeling at that very moment. What happened to my beautiful baby boy that I had just been holding in my arms a short time ago...? As Omar and I sat there motionless, Nurse Karen began to recant the series of events that had occurred over the last hour. She told us that Samad went into cardiac arrest and had to be shocked, that his heart was hovering around 30 bpm and they were waiting for an airlift to the nearest children’s hospital, DuPont in Wilmington, Delaware. I struggled out of bed, with Omar by my side, barely able to stand from the pain of my cesarean. Nurse Karen walked us down a long hallway to an elevator that we took to the eighth floor. When we got off the elevator there was a set of double doors, just beyond them doctors were trying everything medically possible to save our little Samad's life. Over the next 8 hours Samad would go into cardiac arrest and have to be revived over a dozen times, they would administer intravenously all types of drugs in attempts to stabilize his heart but nothing seemed to work. The doctors could not give us any answers; they just knew that his heart was not functioning properly. At one point doctors thought he was stable and invited us bedside to see him, however it was short lived when he flat lined and staff rushed us out so that the team of doctors could revive him yet once again. Time was not on our side as we were still waiting for an airlift to a children’s hospital. By now it was virtually impossible as the blizzard like conditions shut the city and surrounding counties down. Occasionally Nurse Karen would come out into the cold, dim hallway to inform us that they were "still working on stabilizing him" and then she delivered the devastating news; the helicopter attempted to reach us but had to turn back around because of low-visibility due to severe weather conditions. An utter silence fell over the room, including the team of doctors who had been working around the clock. Then a very small man, in a white coat, almond skin and glasses approached us. I cannot remember his name but I remember the look of desperation in his eyes when he basically told us if Samad did not get the expert medical attention that he needed, he would not survive because there was nothing else they could do. Not able to move, cry, speak or even breathe at times I paced for hours in that little hallway, waiting for an answer. Omar, a much stronger person than I am, held it together for the both of us. Although I could clearly see the pain and fear in his eyes, he never wavered and remained faithful. He said to me, "Babe all we can do is pray and ask Allah for His mercy. The rest is up to Him." So we did, we prayed and prayed and then we prayed some more... Finally, we received some hopeful news; a hospital down in the city, Children's Hospital of Philadelphia (CHOP) was able to reach us via ambulance and would be arriving within a couple minutes. Unable to leave because I was still a patient and receiving medical attention, I said my goodbyes and Omar promised me, “Babe I will be with him the whole time. I will not let him out of my sight.” As I watched Samad being transported out in an incubator, the medics allowed me to touch his hand before rushing him off. Omar walked next to Samad, down to the ambulance, once in, he would follow them in our car, alone, driving 20 mph on the snow covered streets of the city, barely able to see through the snow storm. By now it was early morning, the sun was coming up but the snow was still falling. I had not heard any news from Omar yet and the staff at Lankenau could not tell me anything. My immediate concern was the fact that Omar was all alone at the hospital, dealing with unimaginable pain and I was not there to comfort him. I knew that there was one person whom Omar could depend on since he moved to Philadelphia and that was Bro Alphonso. Bro Alphonso and his wife Sis Marchelle had become more than just friends or people we see at the mosque. They were family, along with their children. I didn't hesitate to call Sis Marchelle, and upon hearing my voice she knew that something terrible had happened. I explained to her in detail as best as I could what had taken place. Bro Alphonso was over-hearing the conversation and immediately set out to be by Omar's side. I later learned that Bro Alphonso was unable to drive in the blistery conditions so he caught the trolley down to CHOP. I will forever be indebted to Bro Alphonso and Sis Marchelle for their support from the very beginning.